All lawns need proper nutrients to stay healthy, lush and green, but they need the right nutrients at the right time of year to grow and thrive. For best results, fertilization should be done in early spring, late spring, summer, early fall and late fall. This is an inconvenience and a lot of work for most homeowners who simply don’t have the time and energy to commit to these schedules. Most Northern Virginia soil lacks adequate nutrients to provide proper plant growth, so fertilization is essential. Fertilization promotes healthy, stable plant roots that encourage new, green leaf growth and strong, sturdy plants and trees. It also helps to fight against environmental stresses like extreme heat and cold, drought, foot traffic and constant lawn mowing. Hiring a professional for landscape maintenance services will ensure proper fertilization schedules with applications and products that protect your landscape and keep it healthy and green year-round. With a wide variety of fertilizers on the market, it’s important to select the right one for your landscape conditions. Choosing the wrong type of fertilizer and applying it improperly can actually damage your lawn, plants and trees. An experienced, professional lawn care company can do a property analysis of your landscape to determine your existing soil type, grass type and landscape conditions. This analysis will determine the best fertilizer to keep your landscape green and healthy all year. Mulching is a simple, inexpensive way to provide extra benefits to your landscape. Mulch provides a protective layer of material on top of the soil. It promotes strong plant roots and healthy growth for your grass, plants and trees. Although mulching provides numerous landscape benefits, it’s a job that can take up a significant amount of your time and money. 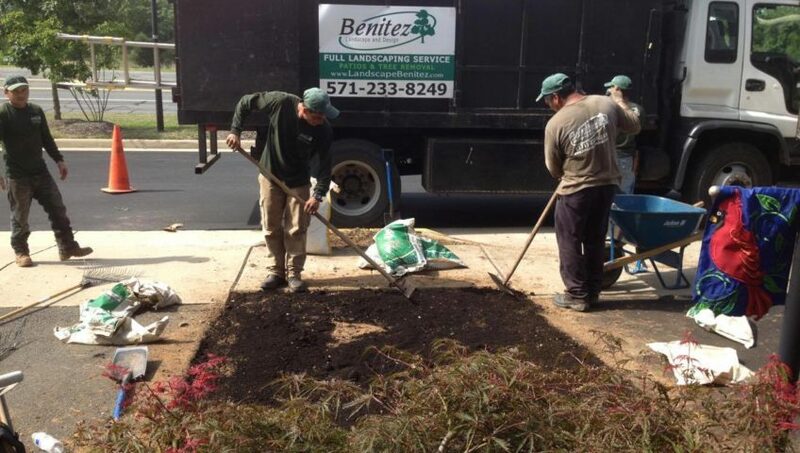 Hiring a landscape company who provides mulching landscape maintenance services in VA will save you time and money, as well as an aching back from hauling and spreading mulch around your property. If you’re currently taking care of your own landscape needs, you’re probably spending a lot of time and effort on yard work. Even with a small property, a beautiful landscape requires constant upkeep and a year-round commitment that’s inconvenient for most homeowners. To keep your landscape looking great and well-maintained, you will need to take care of routine lawn mowing, watering, weeding, fertilizing, pruning and pest control. You will also need to address lawn diseases, insects and pests, fallen debris and irrigation and drainage problems that can quickly make your landscape look bad. All of these chores are necessary for a beautiful, healthy landscape, but they require your time, effort and commitment on a regular basis. This is a big responsibility for any Northern Virginia homeowner, even one who has a lot of free time to devote to landscape maintenance services. Mowing the lawn on a weekend can interrupt personal commitments and take valuable time away from activities with family and friends. If your job requires long hours, spending every free weekend doing tedious yard work probably isn’t on the top of your favorite to-do list. Before you decide to tackle your own landscaping needs, you should weigh your time commitments against the costs of a professional landscape service. Hiring a landscape contractor to take care of your landscape needs will give you more free time for things you really enjoy like backyard cookouts, pool parties or relaxing with your favorite book in a cozy hammock. Taking care of your own landscape needs requires time, effort, commitment and money. At Benitez Landscape & Design, we provide convenient landscape maintenance services that fit your property needs and your budget.